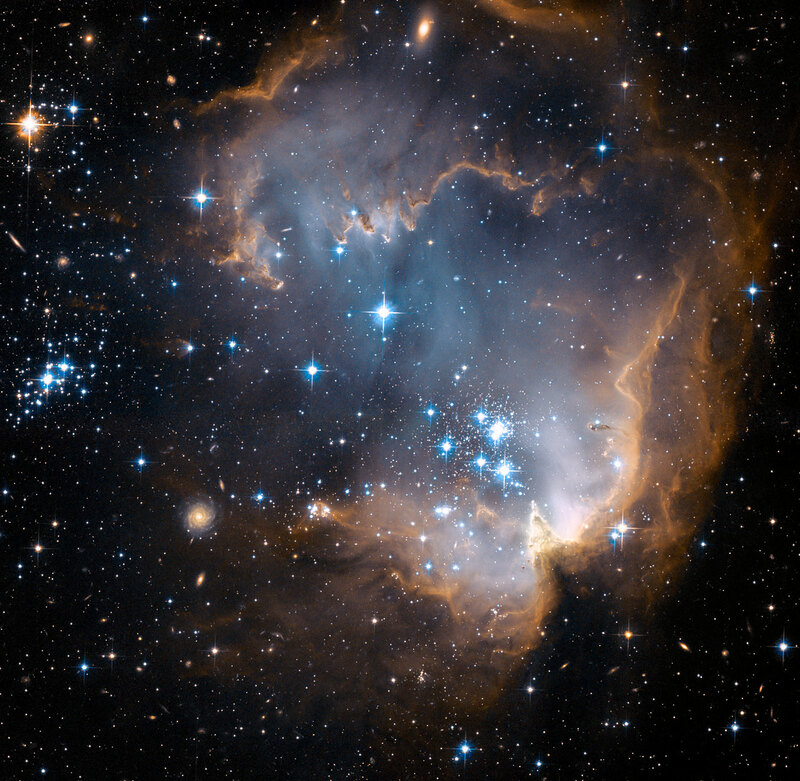 A new image from the Hubble Space Telescope shows N90, one of the star-forming regions in the Small Magellanic Cloud. The rich populations of infant stars found here enable astronomers to examine star forming processes in an environment that is very different from that in our own Milky Way. This new image taken with the Advanced Camera for Surveys onboard the NASA/ESA Hubble Space Telescope depicts bright blue newly formed stars that are blowing a cavity in the centre of a fascinating star-forming region known as N90. 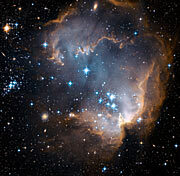 N90 is located in the wing of the Small Magellanic Cloud, in the constellation of Tucana, approximately 200,000 light-years away from the Earth. Its proximity makes it an exceptional laboratory to perform in-depth studies of star formation processes and their evolution in an environment close to that in the early Universe. Dwarf galaxies such as the Small Magellanic Cloud, with small numbers of stars compared to our own Milky Way, are considered to be the primitive building blocks of larger galaxies. 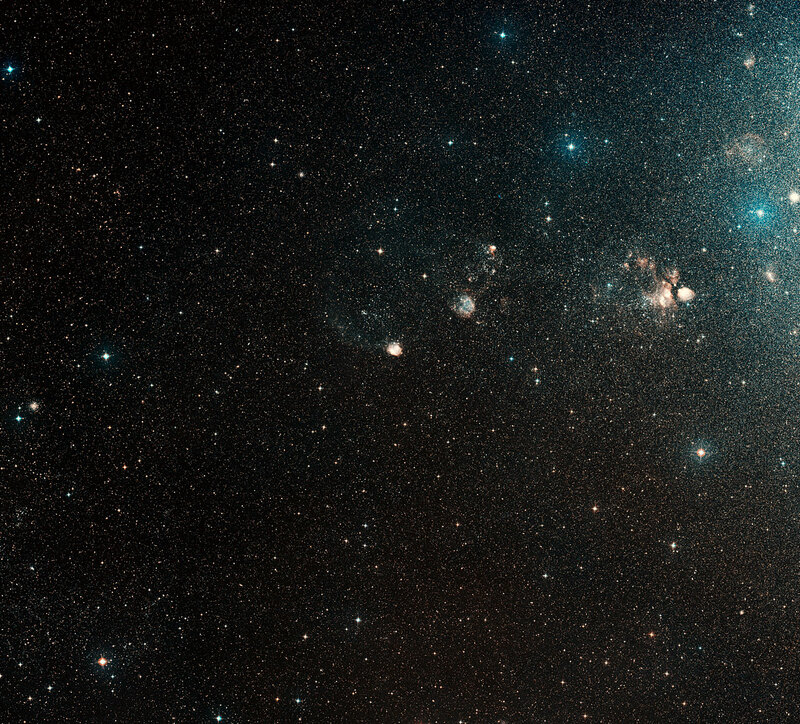 The study of star formation within this dwarf galaxy is particularly interesting to astronomers because its primitive nature means that it lacks a large percentage of the heavier elements that are forged in successive generations of stars through nuclear fusion. Hubble has often been used to observe star birth regions, but they are rarely as stunning and fascinating as N90. At the heart of N90 lies NGC 602, a relatively isolated star cluster whose environment is a close analogue to what existed in the early Universe. The existence of dark clouds of dense dust and the cluster being rich in ionized gas suggest the presence of ongoing star formation processes. Ridges of dust and gaseous filaments are seen towards north-west (in the upper left part of the image) and towards south-east (in the lower right hand corner). Magnificent elephant trunk-like dust pillars point towards the hot blue stars and are tell-tale signs of their eroding effect. An international team of astronomers, led by Antonella Nota of the European Space Agency and the Space Telescope Science Institute in the US, has discovered a population of small newborn stars scattered across the picture. Observable around the bright blue stars at the centre of the image, these stars have caught astronomers' attention because they are still forming from gravitationally collapsing gas clouds. Furthermore, they have not yet contracted to the point where their cores are hot enough to begin converting hydrogen into helium. In this region it is possible with Hubble to trace how the star formation started at the centre of the cluster and propagated outwards, with the youngest stars still forming today along the dust ridges. This image was presented by Lynn Redding Carlson, Johns Hopkins University, at the 2007 January meeting of the American Astronomical Society in Seattle. The other science team members are: L. Carlson (JHU), M. Sirianni (STScI/ESA), E. Sabbi (STScI), M. Tosi (INAF - Bologna Observatory), J.S. Gallagher (Univ. of Wisconsin), M. Meixner (STScI), M. Clampin (GSFC), S. Oey (Univ. of Michigan), A. Pasquali (MPIAE), L. Smith (STScI/Univ. College London), and R. Walterbos (New Mexico State Univ. ).